On Monday, the online partnership of PartyPoker and the Borgata posted a draft schedule of their upcoming seven-figure tournament series in New Jersey. The second annual running of the New Jersey Championship of Online Poker (NJCOP) is slated to span nearly three dozen events over 11 days in April (April 16 – 26), and like previous online series, will coincide with a live Open event at the Borgata. The preliminary version of the NJCOP II can be found here. In what has become something of a recurrent theme, PartyPoker is encouraging users on both the Two Plus Two and PocketFives forums to chime in with their feedback. Thus far, players have responded in droves, with some using the outlet to comment on the schedule and others to voice their grievances with the oft-criticized network. Unlike January’s GSSS II, which broke each of its 23 events into three buy-in tiers, the NJCOP II will feature 32 individual events. While the overwhelming majority of the events will of the No Limit Hold’em variety, the schedule appears slightly more diversified than last year’s iteration. The network will host five Omaha events (two PLO and three PLO8), a 7-Stud event and a Fixed Limit contest. Events #1 and #20 are marked as “Player’s Choice.” Players are invited to submit their preferences on the forums. Once sufficient feedback has been collected, the network will record the top 3 format preferences and poll players via email for a final vote. Buy-ins will run the gamut from $50 to $1,000 and guaranteed prize pools will range from $10,000 to $150,000. The April 26 Main Event will tout a $150,000 guarantee and a $200 buy-in. Game formats include Super Bounty, Deepstack, 6-Max, Heads Up, and Speed Down, among others. Weekday events will be held at 6:00 pm and 7:00 pm, and weekend events at 3:00 pm, 5:00 pm, 6:00 pm, 7:00 pm and 8:00 pm (Sundays only). The total guaranteed prize pool across all events is $1,000,000. The NJCOP will overlay neatly with the Borgata Spring Poker Open, beginning one day after the Open kickoff and concluding just as the WPT World Championship gets underway. This move is designed to capitalize on the influx of out-of-state players that will be stationed at the Borgata for the live events. The network’s three previous special series, including last year’s inaugural NJCOP, also coincided with a Borgata-hosted tournament series. However, this time around Party / Borgata’s cross-promotional measures stand to be even more effective, as the network has recently upgraded its mobile application to include multi-table tournaments, which means that players will have the capability of grinding out live Open events and NJCOP tournaments simultaneously. One of the more prevalent reactions to the NJCOP II draft schedule was that it catered almost exclusively to the network’s professional and well bankrolled semi-regular players, leaving recreational and budget conscious grinders left to dry. This complaint is warranted, as the average buy-in to a NJCOP II event is nearly $200, and there isn’t a single tournament on the schedule that features a sub-$50 buy-in. Compare this to the GSSS II, which boasted a plethora of $5 – $20 buy-in events. Participants in the $15,000 WPT Championship and other high buy-in live events will not feel compelled to play small buy-in online tournaments. Small top prizes may illicit angst from players expecting to be able to parlay a nominal buy-in into at least a four-digit score. The network’s servers have proven ill equipped to handle significant server load. 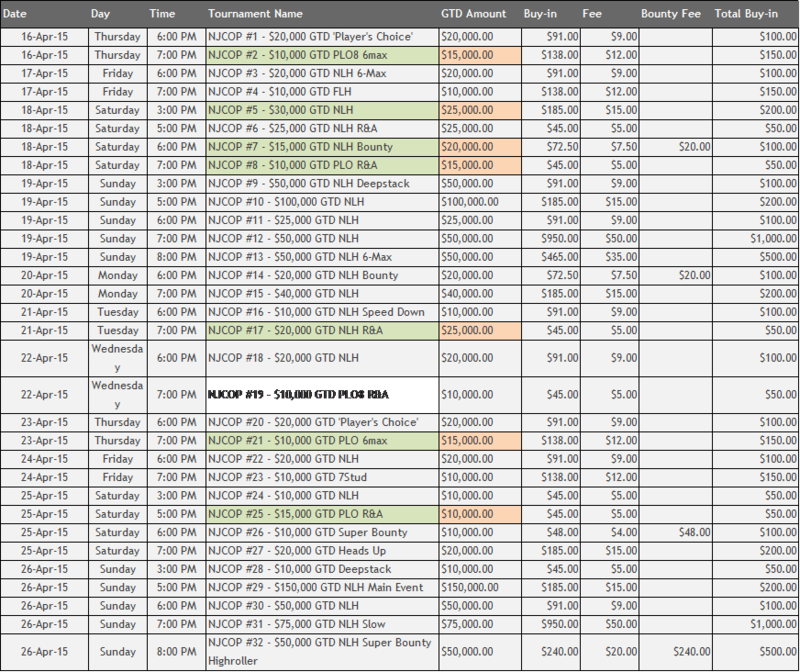 One viable solution may to run a higher than average number of low buy-in and points satellites into NJCOP II events. Instead of offering schedule feedback, some players took the opportunity to not-so-politely remind Party / Borgata that its main priority should be on improving its site and overall user experience. Again, their complaints are warranted. Then, in January 2015, history repeated itself. This time around, an alarming frequency of runners experienced connectivity problems during the GSSS II Main. Although players materially affected by the company’s failings were issued a goodwill credit, the network’s reputation appeared to be irrecoverably tarnished. Considering that the network has yet to release a software update that fully resolves outstanding MFC errors and connectivity issues, the inclusion of low buy-in events may do more to hinder the network’s future ability to attract players to its series’ than promote it. This line of reasoning may have factored into Party / Borgata’s decision not to run a third multi-tiered tournament series. The reality is, Party / Borgata needs the NJCOP II to go off without a hitch. Not only will a smoothly running series go a long ways toward subduing skeptics, but more importantly, it ensures that outcomes will be determined by nothing other than a player’s skill and luck – which is the way it should be. Thus far in March, Party / Borgata has managed to buck the seasonal downtrend that typically comes with the advent of warmer weather by posting 10% cash game average gains. This, as per Poker Industry PRO via PokerScout. A successful NJCOP II may propel daily player counts even higher, but it’s difficult to envision the network surpassing first place WSOP/888, which currently maintains a 19% lead.